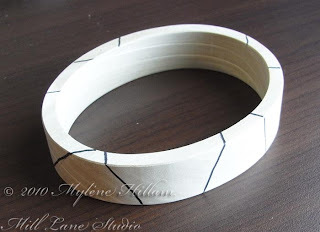 Mill Lane Studio: Bangle No. 2 - Sparkletastic! Today it's time to play with glitter - not just your average, everyday kind of glitter but the wonderfully glitzy, sparkletastic glitter from Art Institute Glitter. This is ultrafine glitter of the highest quality and it comes in such an incredible range of colours. 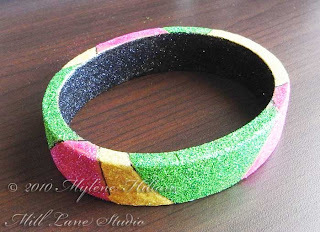 I've begun by dividing the oval Diy Bangle into randomly shaped sections with a permanent marker. Make sure you also section off the top and bottom surfaces but leave the inside blank. I've divided my bangle into 9 sections so for this tutorial I'm calling them 1, 2, 3 etc and as I'm working with 3 colours plus black for this piece I'll call my colours 1, 2 and 3 also. Begin on section 1 and apply Designer Dries Clear generously over the face, the top and the bottom of the bangle. Use your finger to smooth it out and then sprinkle on the first colour. Leave the next section (section 2) blank for the time being and work on the section next to it (section 3) so that the first section can dry. Cover section 3 with colour 3. Next work on section 5 which will be filled with colour 2. 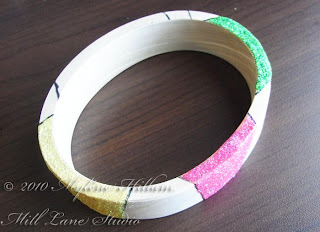 Continue working in this fashion around the bangle so that colour 1 goes in sections 1, 4 and7; colour 2 fills sections 2, 5 and 8; and colour 3 is used for sections 3, 6 and 9. Allow the piece to dry for 10 minutes before continuing. I hung my bangle on a door knob so that the bottom surface also had a chance to dry. 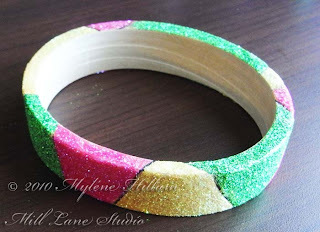 To cover the inside of the bangle with glitter it's best to work in sections as the adhesive will dry too quickly and you'll end up with a patchy cover. Sprinkle black glitter over the inside. Give it a good tap on a piece of paper to catch all the stray bits and return it to the bottle. Let this dry for 10 minutes before moving on. Place an Ultrafine Metal Tip on the bottle and trace over the permanent marker lines between the sections. This takes a bit of practice as air bubbles always form in the tip when you place it back on the work surface. To help avoid getting big blobby lines of adhesive, begin squeezing the adhesive onto a scrap of paper and hold the pressure in the tip. If you let it go, air will be drawn back into the tip and form more bubbles. Hold the bangle in your hand and draw the lines between the sections. I've found that the best way to get straight lines is to move the bangle along the tip rather than the tip along the bangle. Sprinkle with glitter. Keep working your way around the bangle until all the lines have been drawn. 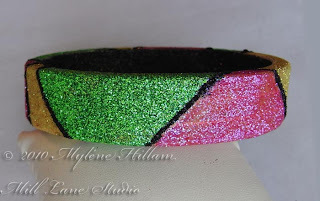 And here's the finished Diy Bangle - Sparkletastic! Now you've seen how easy this is, check out the Art Institute Glitter colour chart. Wow, so many colours to choose from! A big thank you to Art Institute Glitter for providing the products for this project. You can find lots of projects on their website or follow the Art Glitter Blog which has a daily dose of inspiration. Art Institute Glitter - Where glitter is glamorous and bling is always in style! Sparkletastic - Just love it! I put a link up on our Facebook wall. I may want to use this great tutorial on our blog if you would be willing to share some more! Thank you for the mention, sparkle on! Hi Glitter Em. I'm glad you love it. I'll have to get back to you about posting the tutorial on your blog. Will let you know soon! Thanks for stopping by!